"The city is a dark force. The strong come here and become weak. The city takes our strength. 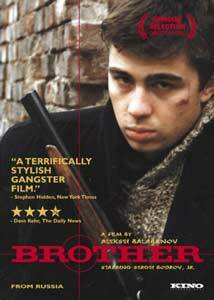 Released in Russia in 1997, Brother was among the first important films with an entirely post-Soviet sensibility. It signaled a renewal for Russian filmmaking, and was rewarded at the box office there as that year's biggest hit. Danila is a restless former soldier who moves from their depressed provincial village to St. Petersburg at his mother's insistence. He has a brother there, Viktor, who has made a name for himself as a prominent mobster. (Does the heckling mother know the reasons for his success? Does she care?) Viktor offers him work, first by sending him to assassinate a Chechen criminal, but all of Danila's assignments come with hints of double-cross. It quickly becomes clear that Viktor sees his provincial brother as a ticket out of troubles of his own making. Likewise, it doesn't take long to see that wide-eyed Danila is no fool. The film manages a strong sense of place, but part of its trajectory is in the constant sense that there's always somewhere better, bigger, richer. The St. Petersburg of the film (still known as Leningrad to many) is an almost third-world city that remembers what it was to have been a world capital. Something deeply ingrained in the architecture, the streets, even the people, remembers what it was to have been a place of importance before being set aside by the Soviets, besieged by the Germans, and abused by the capitalists. Still, Danila comes to St. Petersburg because his mother dreams of opportunity for him in the big city. In St. Petersburg, everyone dreams of Moscow, and "Peter" is little more than an urbanized backwater. Danila moves effortlessly through the criminal underworld, but it becomes clear early on that Peter won't be able to contain him for long, there always being new worlds to conquer. That has an almost video-game-style neatness to it. Danila never seems to have any particular ambition, but he knows what it is to survive, and his secret is to keep moving. Do what needs to be done, and move on to the next level. The stolid, mysterious quality of Danila works because we're as interested in what he'll see next as he is, and who he'll meet. And what he'll listen to: 90s-Russian-new-wave music is always playing around the margins. Is there any more potent signal of the angst of a particular time and place than its music? None of the characters are wasted, and they all have something to say about the city and about life after the Soviet Union. Danila's brother Viktor is a powerful criminal with feet of clay, and his friend Nemets is a homeless German who finds Danila's violent life distasteful, in spite of having clearly paid a price for his relentless conscience. Two women compete for his affections: Kat is a drug-addled street kid, while Sveta is a married tram driver in what passes for the working class. Danila himself is a wonderfully iconic character. As played by Sergei Bodrov, Jr. (tragically killed at 30 during a rock-slide in 2002), he's almost super-heroically tough, but deeply sensitive. The violence that he commits in the film is largely in the service of the weak, and he's merciful when it's called for, so he gets to do all of the things that bad guys do, but without guilt. An avenging angel, though you never feel that he gives it much thought. He's served as, he says, a desk clerk in the military. While I think we're meant to assume he's lying, that a desk jockey couldn't possibly have his self-assuredness or skills, I like the idea that he's telling the truth. He's a force of nature, nothing less. The film feels rough and bloody, but almost all of the violence is suggested. I was about 2/3rds through the thing before I realized that though plenty of nastiness occurs, there's very little actual blood. I'm not sure if that's cleverness on the part of director Aleksei Balabanov, budget constraints, or restrictions placed on mid-90s Russian filmmaking, but it's refreshing, nonetheless. The axiom that what we imagine can be far more potent than what we see is as true in gangster films as it is in horror movies. Brother was extremely popular in Russia (leading to a similarly popular sequel), but the uniquely Russian sensibilities of the movie run alongside U.S.-born gangster movie tropes in a way that I expect will play well with Americans who get a chance to see it. Image Transfer Review: Kino's transfer is well-done, if unspectacular. The film has a slightly muddy, washed-out style overall, but it's represented fairly well with no big flaws aside from some mildly noticeable edge-enhancement here and there. The only major issue is the lack of anamorphic transfer. Not a deal-breaker, but it certainly would have been nice. Audio Transfer Review: The Russian mono track is naturally a bit flat, but consistently clear. Definitely unspectacular for an action movie like this, but the track is good enough for what it is. Extras Review: The only extra included here is an Image Gallery with a few stills from the film and film production. Image Entertainment released a now-out-of-print edition of this a few years ago with a couple other extras, so it's disappointing that there isn't a bit more. Brother was an enormous hit in Russia when it was released in 1997, and it's not hard to see why. It's as smart as it is entertaining, and has all the energy of the best Tarantino with a good deal more to say than most modern crime films usually muster. An anamporphic transfer would have been nice, and there aren't any extras to speak of, but this is a nevertheless solid presentation of a popular, well-done Russian film making its way to America.